Referral Reward Program | Credit Card Industry, Inc. Refer your friends, associates, and businesses. Credit Card Industry Referral Reward Program rewards everyone for referring friends, associates, and businesses to us. 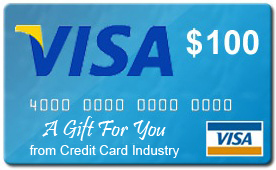 When a valid referral is made, the referrer receives a $100 Visa Gift Card for each business referred to us. A referral is considered valid when a new customer has activated a merchant account and has processed a credit card transaction. To learn more about the program, call 800.528.1782 or fill out the form.